An amazing thing, the original Alfa Romeo BAT (not to be confused with the Alfa Romeo Bat 11) has a drag coefficient of 0.19, better than the GM EV1 or Toyota Prius, all made without the help of a computer or the kinds of advanced techniques designers now have at their disposal. By comparison, the original Dodge Viper had a 0.45 Cd and the 2003 Hummer H2 garnered a 0.57 Cd. 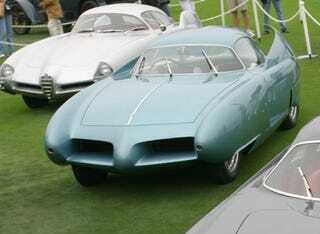 It took aerodynamic principles typically utilized by planes and a bit of intuition on the part of Bertone to create a gorgeous and unique bullet of a car. Ahhh... the good old days. And while the Renault Ondelios concept is quite original, DeadFlorist sees a bleak future for the vehicle. Sources at Renault say that while the concept includes radical design cues and a revolutionary control system based on projected light and touch sensitivity, the production model will look like a Prius.